There are hundreds of vegan alternatives to animal products. Going vegan isn’t about elimination. Veganism is not a starvation or deprivation diet. Rather, it’s about finding vegan alternatives for the foods you love and incorporating new foods into your diet. I now eat foods I had never heard of before going vegan. Things like dragon fruit, tahini, purple potatoes, and tempeh. But I also still eat plenty of the same foods I grew up on, like chicken tenders, mac n’ cheese, and cereal—I’ve just learned to swap in the vegan alternatives. Vegan swaps aren’t always specialty items either—you don’t have to drive an hour away to a natural food store. Most of these swaps can be done at your local grocery store (and sometimes even Target and Amazon). By swapping out the animal products, you can still enjoy the foods you love without the cruelty, cholesterol, and so on. If the most common animal products are slowing your transition to going vegan, start swapping! It seems like it’s more difficult for people to give up dairy products than actual meat products, which is probably why many people go vegetarian so easily but find veganism too hard. If it weren’t the twenty-first century, I’d sort of understand where they’re coming from, BUT vegan cheese alternatives today are realistic, sharp, and flavorful. One of the first recommendations you’ll get for cheese alternatives as a new vegan is nutritional yeast—which is great in place of parmesan and grated cheese—but you’ll be truly impressed by the products on the vegan cheese market these days. You can find the leading non-dairy cheese brands at Whole Foods, of course, but other grocery chains like Sprouts, Vons, Ralph’s, and Albertson’s carry them as well. Some stores like Trader Joe’s even carry their own line of vegan cheeses. Homemade vegan cheeses are evolving as well. We know and love the classic potato-carrot cheese for vegan mac n’ cheese, nachos, or dipping sauce, but you can also make nut-based cheeses at home. Miyoko Schinner of Miyoko’s Creamy has a cookbook, Artisan Vegan Cheese, all about making your own vegan cheese at home. While we’re on the topic of dairy, let’s talk the never-ending list of plant milks. Non-dairy milk is becoming so popular among consumers that the dairy industry is slowly declining. Once you learn the truth about dairy, you’ll never want to go back. 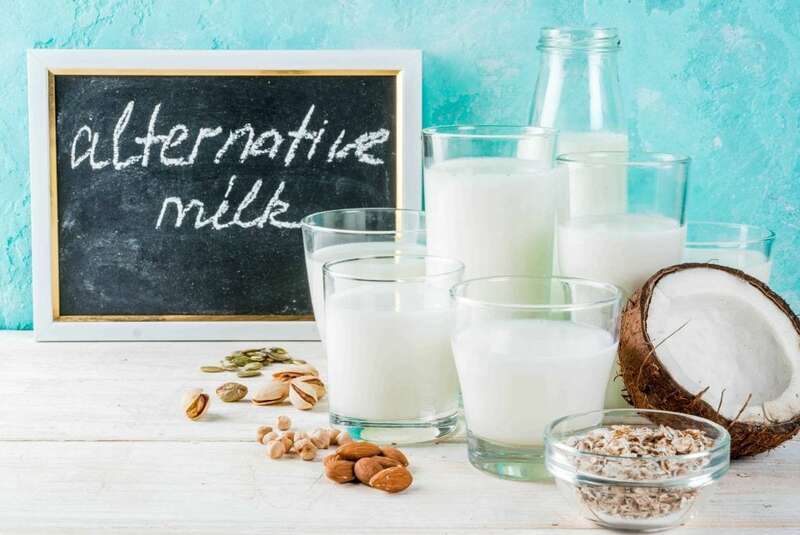 Fortunately, you can take your pick from dozens of different types of non-dairy milk! Step 1: Choose your main ingredient. Step 2: Choose your sweetness level. Step 3: Choose your flavor. You’ll find that you prefer some non-dairy milks over the other depending on the application. I love chocolate-flavored soy milk but prefer to use almond milk in mashed potatoes and oatmeal. Coconut milk comes in handy for Indian-style recipes like lentil dahl, and both coconut and cashew milk make for creamy yogurt. To round out the vegan dairy alternatives, let’s skip to my favorite course—dessert. I have a small addiction to sweet treats, especially after eating something savory. When the cravings kick in, I can substitute dairy ice cream for banana “nice cream” or I can indulge in the vegan ice creams. I wish I could say I go for the bananas most often, but I’ve tasted the best ice cream of my life since going vegan—and it’s all made with plant milk! If you have Ben & Jerry’s or Haagen Dazs locations near you, you can get vegan ice cream on the go! Some stores like Trader Joe’s and Whole Foods even carry their own brand of vegan ice cream. Since discovering all the non-dairy ice cream alternatives, I eat ice cream more than ever! Having this many vegan options is both a blessing and a curse. Pro tip: New vegan ice creams are coming out consistently! When checking to see if a store carries a new vegan product near me, I check Instacart.com for the availability and price! This isn’t 100% accurate, but it doesn’t hurt to check if the store locator tool doesn’t tell you if a new product is now carried at a store near you. People are surprised to hear that vegans don’t eat honey, but when you think about it, it’s obvious. Honeybees work hard for their honey, and we don’t need it. Why take something that isn’t ours when we have so many alternatives? Honey is an interesting topic for new and existing vegans because it’s one of the last things to go—you probably don’t even picture honey when you think of animal products. Alas, honey is not a victimless sweetener, so swap it out for the million other sweeteners out there. Honey does hide in some pre-packaged products like cereal, granola, and oats, so be sure to veganize these foods by making them at home or check the label carefully for an accidentally vegan version. Do people even use eggs in baking anymore? From what I’ve seen on Pinterest—vegan replacements for eggs in baking—eggs are not the go-to binding ingredient anymore. Replacing eggs in your breakfast may seem impossible, but you’d be surprised at the versatility of a good block of tofu. The infamous tofu scramble is a foolproof way to still enjoy scrambled “eggs” for breakfast and makes for a great topping on toast or in a breakfast sandwich. If you’re new to veganism or incorporating more plant-based meals in your diet, you might still think than lean chicken breast is the healthiest and ultimate source of protein. For many people, white meat is considered healthier than red meat. I felt that way, too, but I now know that chicken breast has nearly identical levels of cholesterol and fat as all other meats. All of America still thinks chicken is the healthiest food on the planet! Want to see for yourself? Search for the hashtag #mealprep on Instagram, and you’ll see that the Standard American Meal Prep consists of brown rice, broccoli, and chicken breast. Time to swap out that last one! Stores like Trader Joe’s, Ralph’s, and Target have their own lines of vegan chicken substitutes to try. My favorite is the Trader Joe’s brand—I like it even more than the holy grail of mock meats, Gardein! Vegan beef substitutes are ahead of the game. Seriously. Out of all the faux meats, vegan burgers are the most realistic, and they’ve come along way from garden burgers and black bean patties. In recent years, we’ve seen the 100% vegan Beyond Burger take it’s place next to real beef in the meat aisle. That’s progress! While homemade veggie burgers still have their place in your life, sometimes you just want to toss a meaty veggie burger on the barbecue. OR you want to trick your non-vegan friends and family to show them how authentic vegan food can be. Be sure to check out the store brand of vegan beef as well. Stores like Ralph’s and Trader Joe’s have their own meatless crumbles that are super versatile. Pro tip: If Amazon Fresh serves your area, consider yourself in luck! Before the Beyond Burger was available near me, I ordered a dozen patties on Amazon Fresh. This service is no longer available in my area, but I wish it was for the variety of vegan options they offer. Prime Pantry still has some great vegan options, and this service is available to everyone. Thank the vegan heavens for plant-based pork options so ‘BACON THO’ will never hold you back from going vegan! I didn’t realize how bacon-obsessed the human population is until I went vegan, but now I can’t un-see the horrible deaths that pigs endure for humans to eat that bacon. For me and many others, the vegan bacon is way better because it’s cruelty-free. There’s tons of vegan pork products to choose from, but the one that’s the most popular in the vegan community right now is the Beyond Sausage. Some people say it’s more realistic than the Beyond Burger! Either way, it’s delicious and totally vegan. It’s currently available at some Whole Foods and Veggie Grill locations. Plus, there’s several ways you can make vegan bacon at home with healthy ingredients—coconut, shitake mushrooms, tempeh, seitan, etc. And don’t forget that McCormick Bac’n Pieces (aka bacon bits) are accidentally vegan! Have you ever heard a vegetarian say they only eat dairy, eggs, and fish? For some reason, people are more disconnected with the cruelty inflicted on fish than they are to other animals. That’s why we have the term pescatarian who describe vegetarians who still consume fish products. Gelatin is a strange one both in what’s it made of and how it’s not the first ingredient that comes to mind when you think of animal products. I cringe when I see gelatin on an ingredients label, and here’s why you should too. Gelatin is a thickening agent made from the boiled skin, tendons, ligaments, bones, and connective tissues of dead cows and pigs. Gelatin is the main ingredient in jelly foods and candies like Jell-O, gummy candies, marshmallows, fruit snacks, and plenty of other pre-packaged foods. Gelatin also hides in gummy vitamins and soft gel supplements, so be sure to check the label. Fortunately, there are thousands of vegan vitamin and supplement products to choose from that are gelatin-free. It’s important to note that while vegan alternatives to meat and cheese are delicious, they’re not always healthy. After all, Oreos are vegan…but definitely not healthy! These products are meant to make it easy for new vegans. They’re not meant to be a staple in your diet. Certain vegan alternatives, like almond milk and tofu, are a lot healthier than others. For more information on how to stay healthy as a vegan, click here to read our guide on vegan nutrition. Where to buy vegan alternatives? I’m a huge proponent of online shopping since Amazon, VitaCost, and ThriveMarket are so vegan friendly. Plus, there’s an all-vegan online retailer called Vegan Essentials where you have thousands of vegan products at your fingertips. It’s easy to go crazy over there with all the vegan goodies. When you need to make a trip to the grocery store, just know that vegan products are everywhere. Your local grocery stores (even Walmart and Target) are guaranteed to have at least one veggie burger, plant milk, etc. Call ahead or check the brand’s website to see if what you’re looking for is carried near you. I love using InstaCart for this feature. For specialty vegan items, check out your local Whole Foods, Sprouts, or health food store. Brands like Gardein, Boca, Field Roast, and Lightlife can be found in many large grocery chains, so even if you don’t find the exact vegan product you’re looking for, you can still try out what your local grocery store carries. 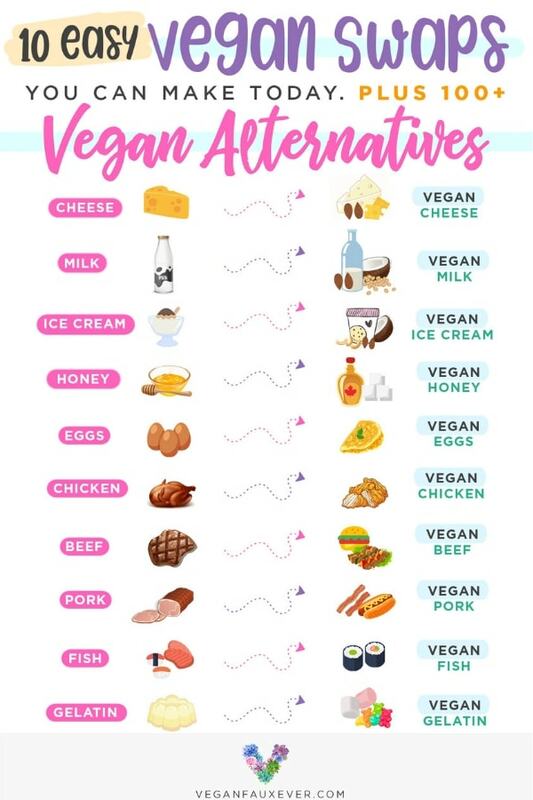 Just remember that you don’t NEED the vegan alternatives in your daily lives, but these faux animal products make our lives a lot easier when we’re first transitioning to a vegan diet or when the cravings hit. We usually go vegan because we love animals, not because we don’t like the taste of animal products! We can still be animal and food lovers once we start to veganize our lives. Lacey is a passionate animal lover and health enthusiast who loves sharing her knowledge of veganism with others. She has been vegan for three years and encourages others to give it a try for their own health, for the animals, and for the environment. She's also a professional writer for hire.